Their street address is: 3435 N. Atlantic Ave., Cocoa Beach, FL 32931; phone 321-784-4800. Their street address is: 3425 N. Atlantic Ave., Cocoa Beach, FL 32931; phone 321-799-4099. We will be meeting at the Cocoa Beach Courtyard Marriott, a full service hotel offering state-of-the-art conference facilities. 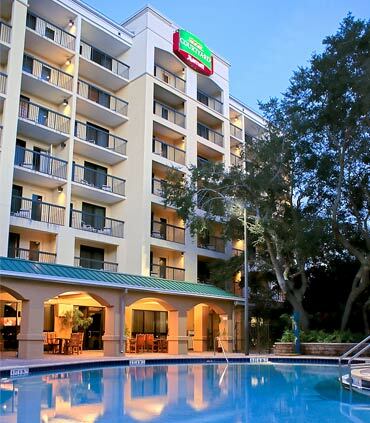 We have a second property right next door — the Hampton Inn Cocoa Beach, which offers a complimentary full breakfast. Both hotels have offered us the current govt. rate of $103/night. The hotels are near Kennedy Space Center, where SORCE launched in January 2003. In addition to the perfect conference hotel with impeccable facilities and service, these properties are ideally located close to many great seaside restaurants, nature outings, and miles of tranquil beaches. You must make your own hotel reservation. A limited number of rooms have been blocked starting the Saturday before the meeting at the group rate. If we run out, please let Vanessa George know so she can increase the block. Unfortunately, there are no rooms available at the SORCE group rate the weekend following the meeting. Perhaps you could try Expedia or Orbitz for a reasonable rate if you are staying after the meeting.